"My love is like a rose divided into two, the leaves I give to others, but the rose I give to you." - Unknown. What better way to say I love you, then with an elegant and graceful Dozen Red Roses. Throughout the centuries, they have been the truest symbol for love and romance. The rich heritage of the red bud will surely deliver your message of love, admiration and devotion! 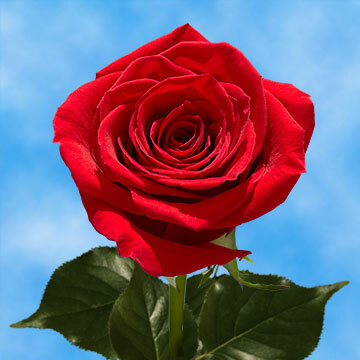 The splendor and quality of freshly cut from the greenhouses of Globalrose.com will leave your dearest dumbfounded by the true beauty of Mother Nature! On Valentine's Day, there is no better means to express your love than with a bouquet! Her eyes will tear on the spot with the exquisite gift! Or for that special anniversary or simply "just because", the delicate yet splendid red blossoms will take her breath away. There will be no question as the love and commitment these floral beauties express in a single package! Or was that first date the start of something special, perhaps a budding romance? A Dozen Red Roses will send a message from the heart that words alone cannot express. 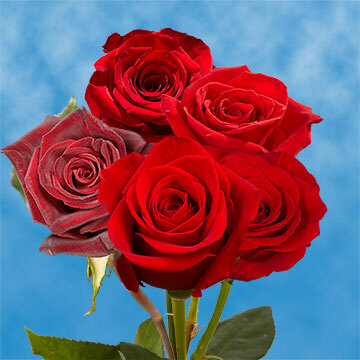 Globalrose.com has been delivering beautifully fresh cut roses to customers for over 30 years! Regardless of the occasion, it will bring a mixture of beauty and brilliance for your sweetheart to enjoy! At Globalrose.com, we are proud to provide our customers with year-round availability. Globalrose.com cuts out the middleman and you benefit as a result. Why pay other retailers or wholesalers more? 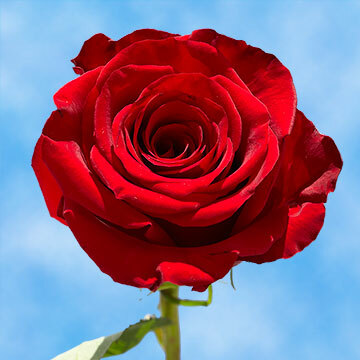 Globalrose.com guarantees that you will receive the freshest and most beautiful florets, cut within 3-4 days of your order, at a much lower cost per stem than you'd pay elsewhere. We take pride in our products and you will too!